On its most basic design an infrared thermometer consists of a lens to focus the infrared (IR) energy on to a detector, which converts the energy to an electrical signal that can be displayed in units of temperature after being compensated for ambient temperature variation. This configuration facilitates temperature measurement from a distance without contact with the object to be measured. As such, the infrared thermometer is useful for measuring temperature under circumstances where thermocouples or other probe type sensors cannot be used or do not produce accurate data for a variety of reasons. Some typical circumstances are where the object to be measured is moving; where the object is surrounded by an EM field, as in induction heating; where the object is contained in a vacuum or other controlled atmosphere; or in applications where a fast response is required. OMEGA Engineering offers a wide range of infrared thermometer in Thailand. 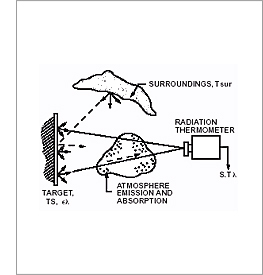 How is emissivity related to infrared temperature measurements? How can I mount the infrared pyrometer? Why should I use an infrared thermometer to measure temperature in my application? Infrared pyrometers allow users to measure temperature in applications where conventional sensors cannot be employed. Specifically, in cases dealing with moving objects ( i.e., rollers, moving machinery, or a conveyor belt), or where non-contact measurements are required because of contamination or hazardous reasons (such as high voltage), where distances are too great, or where the temperatures to be measured are too high for thermocouples or other contact sensors. What should I consider about my application when selecting an infrared thermometer? The critical considerations for any infrared pyrometer include field of view (target size and distance), type of surface being measured (emissivity considerations), spectral response (for atmospheric effects or transmission through surfaces), temperature range and mounting (handheld portable or fixed mount). Other considerations include response time, environment, mounting limitations, viewing port or window applications, and desired signal processing. The field of view is the angle of vision at which the instrument operates, and is determined by the optics of the unit. To obtain an accurate temperature reading, the target being measured should completely fill the field of view of the instrument. Since the infrared device determines the average temperature of all surfaces within the field of view, if the background temperature is different from the object temperature, a measurement error can occur. OMEGA offers a unique solution to this problem. Many OMEGA infrared pyrometers feature patented laser switchable from circle to dot. In the circle mode a built-in laser sighting creates a 12-point circle which clearly indicates the target area being measured. In the dot mode a single laser dot marks the center of the measurement area. A handheld infrared thermometer is one of the most popular type of infrared pyrometer. They are commonly used for portable applications although some models also feature an integral tripod mount. OMEGA offers a large variety of infrared thermometers in various shapes and form factors. Many of OMEGA handheld infrared pyrometers feature OMEGA's patented Circle Dot/Circle Laser sighting which clearly outlines the field of view of the thermometer. The pocket infrared thermometers are extremely compact. They are normally small enough to be carried in a shirt pocket. A infrared thermocouple is a small low cost infrared sensor. They are unique in that they are self-powered and produce an output that mimics a thermocouple sensor. A fixed mount infrared thermometer is commonly used in industrial processes where the thermometer can be mounted in a stationary position. Read the article about High Speed Fiber Optic Infrared Transmitter for information about the OS4000 Series. Given that emissivity plays such a vital role in obtaining accurate temperature data from infrared thermometers, it is not surprising that attempts have been made to design sensors which would measure independently of this variable. The best known and most commonly applied of these designs is the Two Color-Ratio Thermometer. This technique is not dissimilar to the infrared thermometers described so far, but measures the ratio of infrared energy emitted from the material at two wavelengths, rather than the absolute energy at one wavelength or wave band. The use of the word "color" in this context is somewhat outdated, but nevertheless has not been superseded. It originates in the old practice of relating visible color to temperature, hence "color temperature." For high temperature measurements, a hole (depth of which is at least 6 times the diameter) can be drilled into the object. This hole acts as a blackbody with emissivity of 1.0. Measure the temperature in the hole, then adjust the emissivity to force the indicator to display the correct temperature of the material. If the material, or a portion of it, can be coated, a dull black paint will have an emissivity of approx. 1.0. Measure the temperature of the paint, then adjust the emissivity to force the indicator to display the correct temperature. Standardized emissivity values for most materials are available (see pages 114-115). These can be entered into the instrument to estimate the material's emissivity value. The pyrometer can be of two types, either fixed-mount or portable. Fixed mount units are generally installed in one location to continuously monitor a given process. They usually operate on line power, and are aimed at a single point. The output from this type of instrument can be a local or remote display, along with an analog output that can be used for another display or control loop. Battery powered, portable infrared ''guns'' are also available; these units have all the features of the fixed mount devices, usually without the analog output for control purposes. Generally these units are utilized in maintenance, diagnostics, quality control, and spot measurements of critical processes.